Speed: You can hang dozens of shingles in the same time it would take you to complete one or two with a hammer. Reliability: The toughest brands handle falling off roofs and long days of continuous use without giving up. Safety: When used correctly, a nailer is less likely to smash your thumb or break the head off a nail and send it flying at a coworker. Accuracy: Get the same depth results and hit your target mark every time for cleaner results. You can’t start firing nails off into your building project until you’ve loaded the fasteners into the machine. Open the magazine for your nailer, which is either located at the bottom of the equipment or at the back. Keep in mind most equipment only handles a specific size and gauge of nail loaded into a plastic case. You can’t mix and match fasteners of different sizes or pour loose nails into the magazine. Match your nails to your nailer, or invest in a model that can handle a few different sizes with adjustments. There are three steps to firing a nail into a door frame or roof sheathing board. First, align the round tip of the nailer onto the mark you made to indicate where the nail needs to go. Check that the center of the circular tip matches the mark — open-nosed nailers make this step a lot easier because you can clearly see when you’re properly aligned. Next, push the tip firmly against the board and squeeze the trigger or handle to fire off the nail. Finally, put down the nailer and check the results. Most nailers leave the nail just slightly countersunk under the surface of the wood so it doesn’t protrude and disappears after painting and finishing. If you’re hanging shingles, siding, or other materials that need a larger gap left between the nail head and wood surface, adjust the nailer according to the manufacturer’s instructions and try again. 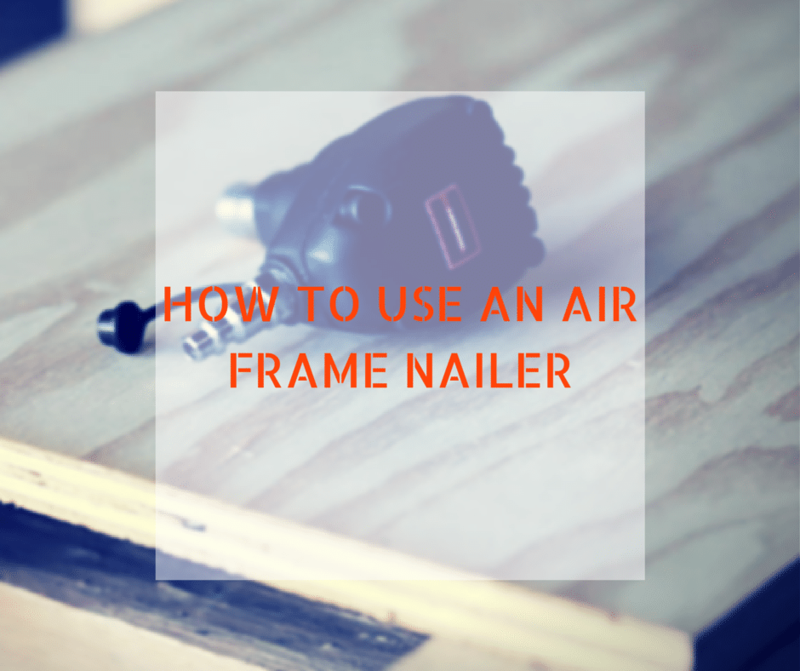 While an air framing nailer makes nailing a lot easier and faster, it’s still different from handling a hammer or using other types of nailing tools. Practice your skills on some spare boards before going to work on your actual building or piece of furniture. Since harder or thinner woods increase the chances of a nail splitting the material and ricocheting out at you, always take the time to test your technique when trying something new. You may need to press the tip harder or lighter against the surface to get the results you want. Sometimes it’s the fastener itself causing the problem, requiring you to switch fasteners. Just like with staplers and other equipment you load with a dozen or more fasteners at a time, jams are always possible. Stop using the nailer immediately if a nail doesn’t come out right. Open the magazine or cartridge holder and pull out the nail that jammed. Unless the cartridge or magazine was damaged or bent in some way and caused the jam, you can reinsert it right away and keep working. Nailers loaded with the wrong size or type of nails will jam regularly. Double-check your fasteners and the condition of the equipment if you have to stop every second or third shot to reset a jam.